Bar Anticipation is everything you’ve anticipated! Customer Service: 5- It was a Friday night at a bar at the Jersey Shore. Luckily, we had the best waiter anyone could’ve asked for. He was attentive answered all our questions and made it a carefree girls night for us. Atmosphere: 5- Bar A has an awesome atmosphere and their own beach, better known as the Grotto. It’s a huge bar and restaurant and I prefer sitting outside anytime I’m there. You literally feel like you’re on a beach, and you’re only a block from the shore. Food/Drink Quality: 5- When I first decided to to have a quick bite at Bar A I wasn’t expecting anythings special and I definitely wouldn’t have expected a bar like Bar A to make their Buffalo Wing sauce on site. But they do and it’s awesome and they range from traditional wing sauce to Mango BBQ. I went with my man a week or two before I went with my roomie and he loved the Mango BBQ. When I went with my roomie Ashley, she loved the traditional we got. I’m addicted to them now! But it doesn’t stop there. We also ordered sandwiches since it was dinner time and we were hungry so we picked a staple– Grilled Cheese with tomato & bacon, they didn’t disappoint and were huge and only $6. Let’s just say I’m pretty impressed with their menu. The drinks at Bar A are great too. We came in on a Friday which is the day they have a happy hour that starts at 4pm and goes until 9pm and they also have specials from 9pm til close. The drinks are always made well and they have a great liquor selection to compliment their bar grub. Drinks aren’t horribly expensive after happy hour ends but it’s so worth it. They always make my 007, Malibu Bay Breeze, and Jolly Rancher to a tee! I’ve also been to Bar A for their famous Beat The Clock Tuesday’s— draft beers start 50 cents starting at 8pm & go up 25 cents every hour. Let’s just say Tuesday’s are like high school reunions for locals. You can find more info on their daily deals here! Price: $- Bar A always has deals so it’s possible not to break your budget for a great night out at the Jersey Shore. I am constantly checking the event calendar and follow them on Twitter & Facebook! The best deal they have is beat the clock– beer and wings, sounds amazing right? You can definitely have a date or enjoy a girls night for $30 & under. I can’t emphasize the beer & wings enough! Final Score: 15/15– When I first started going to Bar A, I wasn’t sure if I was going to impressed or turned off and i was impressed. It’s the bar I prefer to go to anytime I’m home. The daily specials are great, food is up to par for a bar and it’s a great variety, the staff communicates well and it’s always a good time. Just be prepared, beat the clock over the summer tends to grab a huge crowd, but as I mentioned you’re pretty safe any day you go with all the deals they have. They also serve brunch which I have yet to go to but plan on it. I love it and highly recommend it! And then there was one…we were the ‘skinniest fat girls’ that night! 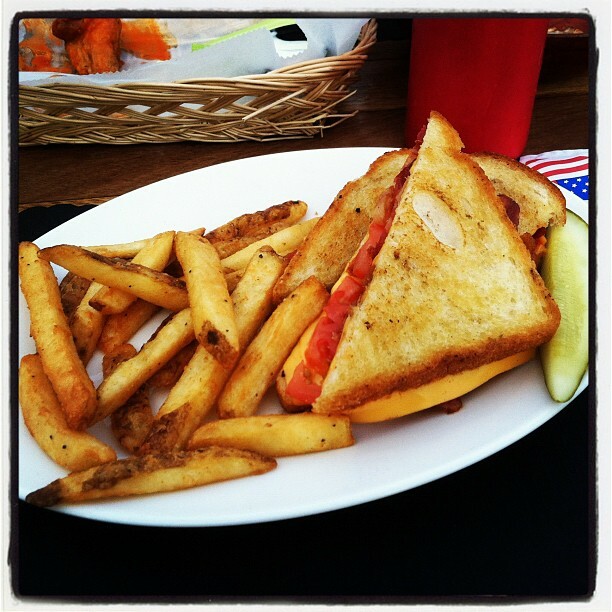 The delicious grilled cheese with french fries & a pickle, for $6! 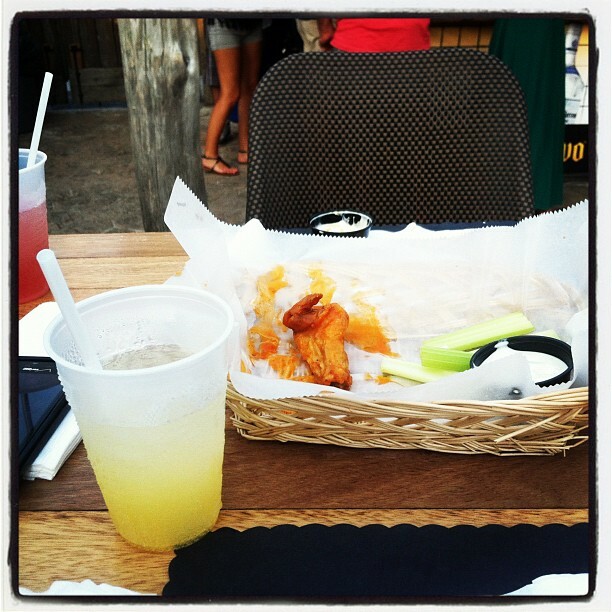 Taking a trip to the Jersey Shore soon, let me know if you agree and what your verdict is about Bar A! This entry was posted in bars, deals, food, happy hour, Jersey Shore, nj, Small Chick Big Deals and tagged bar anticipation, bars, beat the clock, happy hour, jersey shore, new jersey by smallchickbigdeals. Bookmark the permalink.